Market week is finished, and we came home to begin our next big project – an online store. Saturday and Sunday were both dedicated to hand selecting our 25 inventory items that will constitute our online presence when we open up sometime in the next two weeks. The important thing about going online is trying to preserve the character that makes you successful as a brick and mortar. For us, the combination of our inventory mix, our mission to serve the working woman, and our ability to draw from all the lines we have to make truly unique outfits has been our recipe for success. Thus, we really tried to focus on our best lines for today’s busy women – the one’s that can take us from work to evening to weekend. As we were creating our online inventory, some lines were obvious: Sympli, Tribal, Foxcroft, Clara Sun Woo, and Aventura. But we are also known for carrying lines that aren’t typical like Corky’s (the shoe to the right and below). 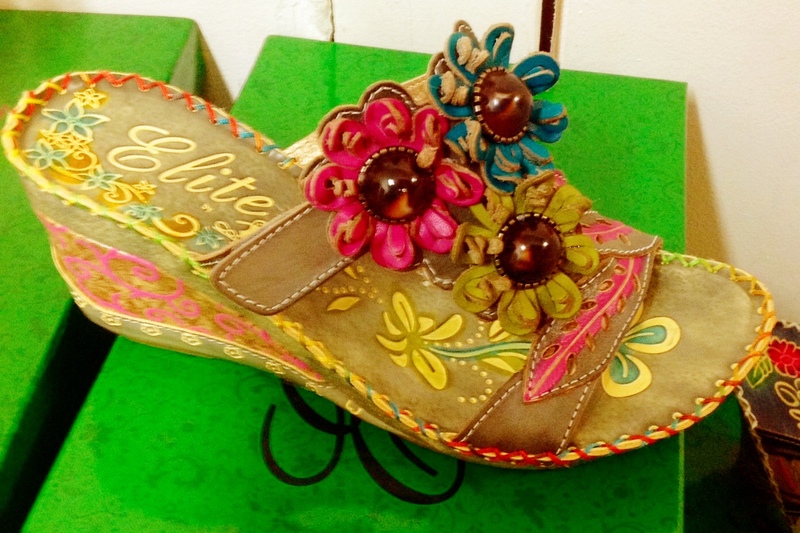 We love Corky’s shoes because they are unique and not something usually found outside of a boutique. After all, isn’t that why we shop boutiques? We want a selection of great brands to choose from but also things we cannot find at our local mall. 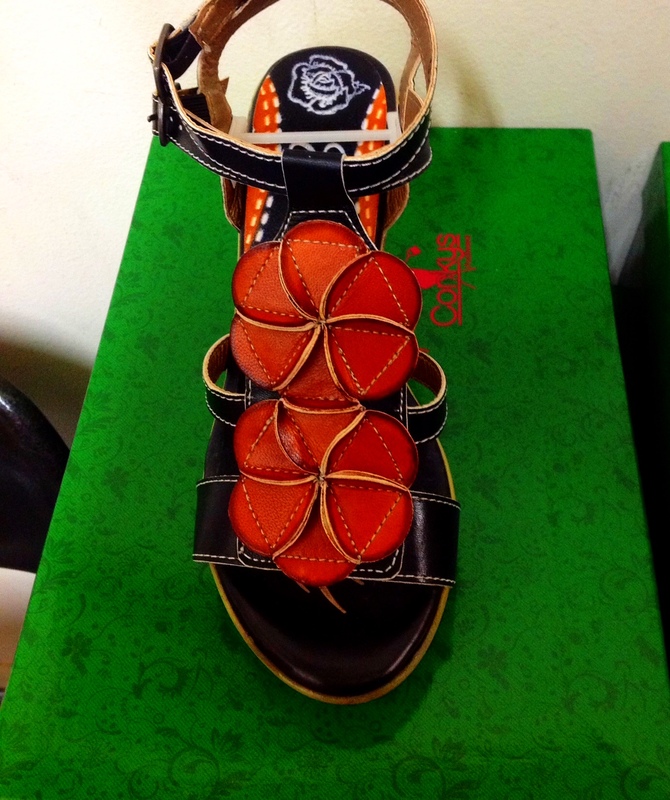 Just look at these beautiful shoes! Today I took our rather large box of clothes and shipped them to New York to be professionally photographed. I sent style notes along with the ways we envisioned the outfits appearing on the models. As I was writing the descriptions, I tried to add that brick and mortar touch of making suggestions how the customer can combine items from several brands to create unique looks and to extend their wardrobe. I hope that our personality as a store comes through. This is an adventure and a learning process. I’m sure we will make some mis-steps, but you don’t stay in the women’s retail clothing industry for forty years without having figured out a thing or two. I’m sure we will figure this out as well. 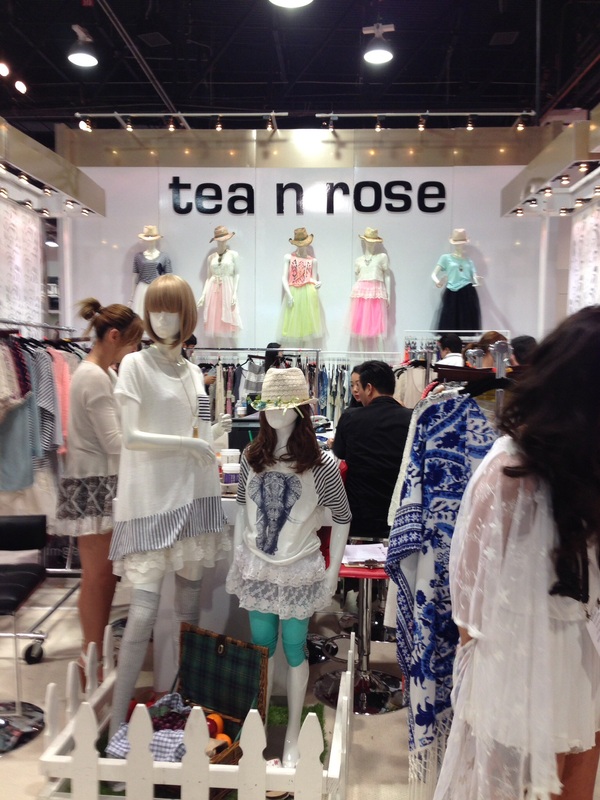 Tea and Rose is a cute young contemporary line we carry at Fashion Crossroads. heathered brown and grey as well as a cute denim cropped legging. We also found several amazing embellished black leggings. I am most excited about the champagne joggers that we bought because these have a silky fabric and Lysee’s fabulous shaper underneath. By the way, a jogger is a loose fitting, silk pant with an elastic cuff at the ankle. They are a key trend. 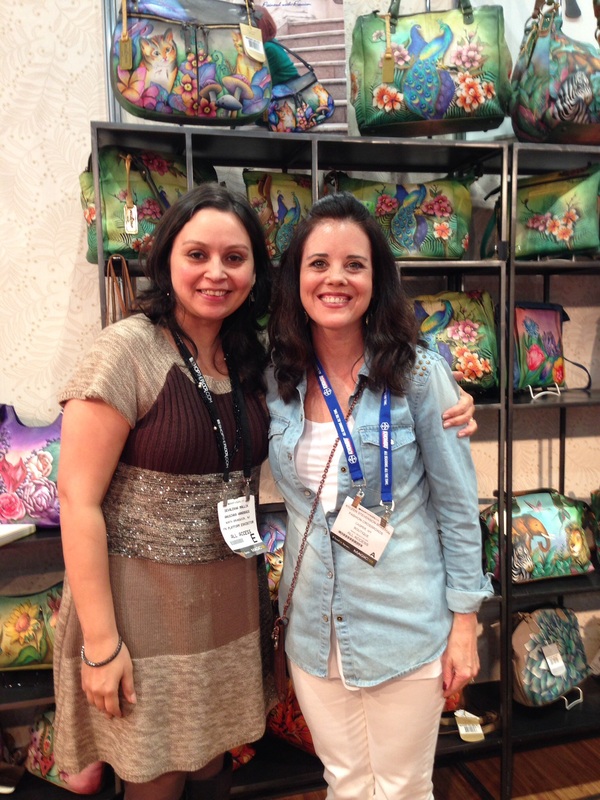 Me and the owner or Anushka handbags. 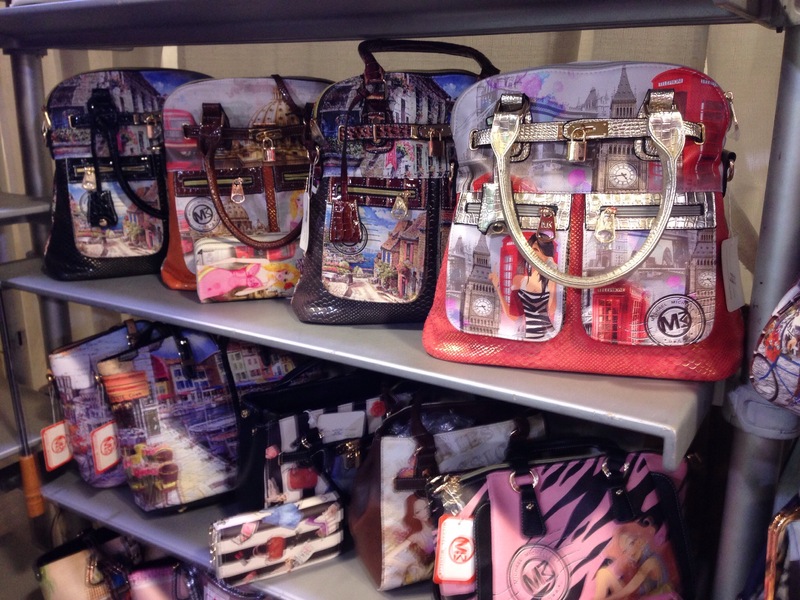 Anushka has some beautiful new purse designs that we will be seeing in Fashion Crossroads this spring.for the season. 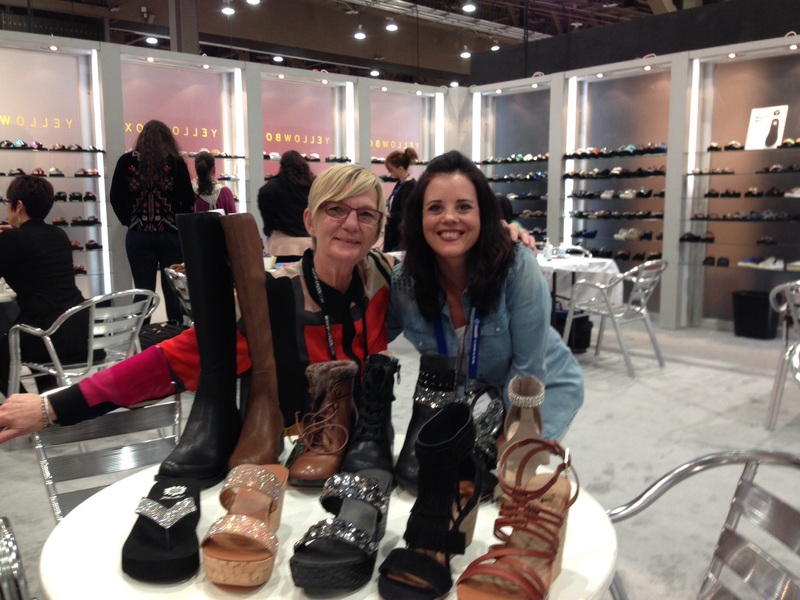 Next we visited Ginger G, one of my favorite young contemporary lines we carry at FC Outlet. As usual, we found lots of really cute tops, dresses and skirts there. And as has been the case with every young contemporary line we visited in the last two days, the booth was packed. Then, we headed to Lush to purchase some more young contemporary items for the Outlet as well as picked up a new line that is very cute and similar to Pretty Angel but younger. This line has a vintage feel and focuses on layering slip dresses under lacey tanks and tops. Sooo cute! You may notice that none of the pictures in today’s blog are from the booths that we visited today. I’ll share some more pictures from today in tomorrow’s blog post because for some unknown reason, I cannot get my photo stream to update on my ipad. Today is just not a good Apple day. I think I’ll put all my devices away for the night and hope everythings goes better tomorrow! Here’s to a new day…. Today we headed to Magic at the Sands Convention Center. This is always the highlight of my week at market because Magic sees more young contemporary and junior buyers than the others we usually visit. 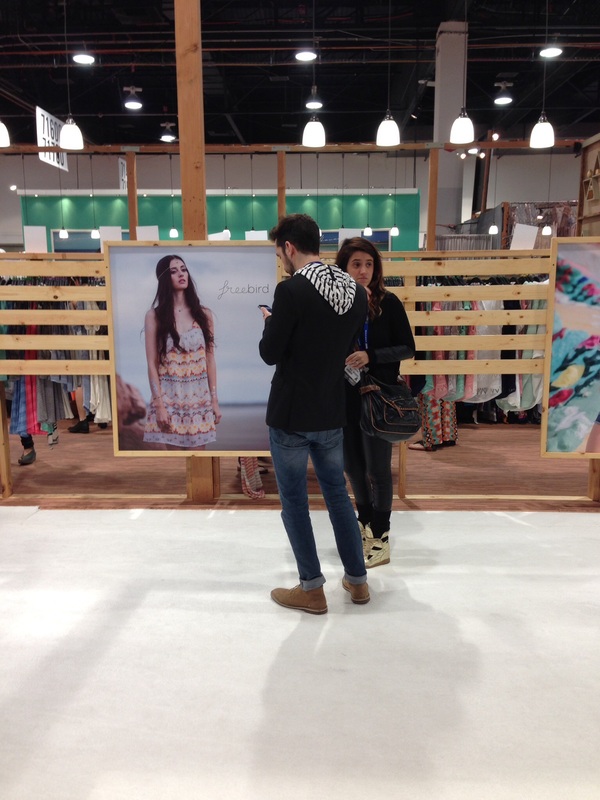 One of my top priorities while I’m there is to pay close attention to the fashion trends I see representated by all the buyers milling about. I have learned over the years that if I see a trend worn by a large marjority of the buyers, it will make it to Casper, Wyoming. Not every trend works its way from the coast, either the West or East, into mid America and especially into the casual, lifestyle wear driven Rocky Mountains. I saw many, many buyers wearing the shoe boot, cropped and rolled skinny jean combo, both male and female. I saw quite a few plaid shirts, long vests, kimonos, skinny jeans and tall boots, short jumpers, gladiator inspired shoes, and lots of beat up jeans. Check out the floral bomber, gladiator heels, colored skinny jeans and boots. This on trend market attendee is showing off his rolled skinny jeans and lace up boots with a blazer and hoodie. These shots are candid, catching buyers doing their thing…buying and checking their phones! vendor we visited but especially the young contemporary and junior vendors. Between the grey trend and the still very popular cream and white vintage lace and bohemian trend, it was a struggle to find things in color. But, have no fear, while we will definitely have a preponderance of greys and neutrals in our young contemporary department this spring, you wil also find soft florals and pastels to break it up. It is also worth mentioning that despite the fact that the key color for 2015 is marsala, it seems it is used mostly as an accent color for spring. Today we bought from Elan, Blu Pepper, Tea and Rose, Vocal, and Anushka. We picked up NikiBiki and Jamierocks as two new lines for the store. NikiBiki was recommended by a customer is similar to Tees By Tina but less expensive and in plus sizes. They also have exceptionally cute active wear which you will be seeing in the store as well. Jamierocks is a great new jewelry line that offers daintier, multi-layered jewelry at great prices. 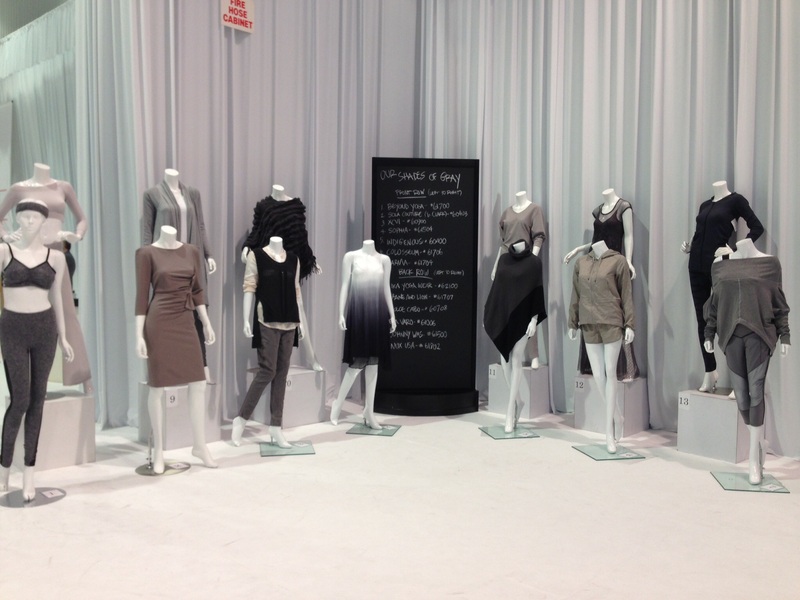 Tomorrow we will see Ginger G and Lush for FC Outlet and a few other new young contemporary lines that we saw today. Tune in tomorrow for more info! 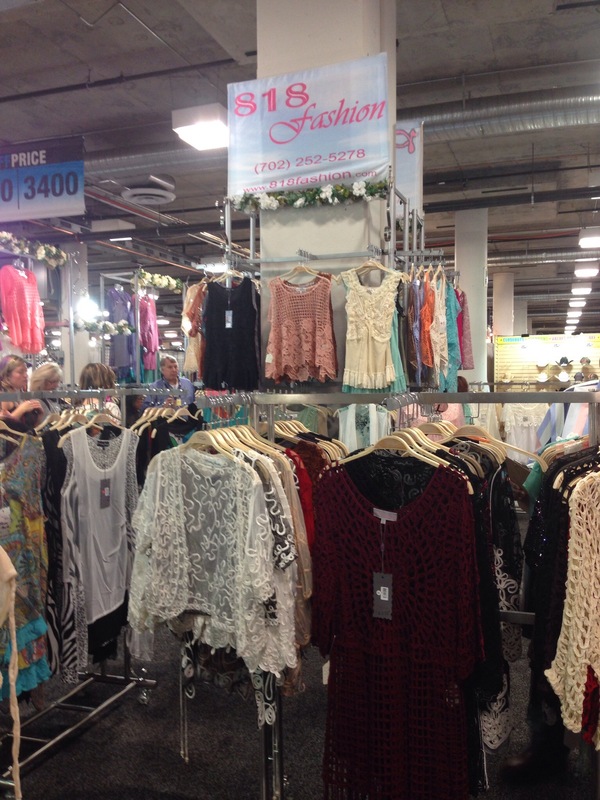 Today we shopped the WINN Show, short for Women’s Wear in Nevada, at the Rio Convention Center. The WINN show is focused on speciality stores and has many of our best lines. 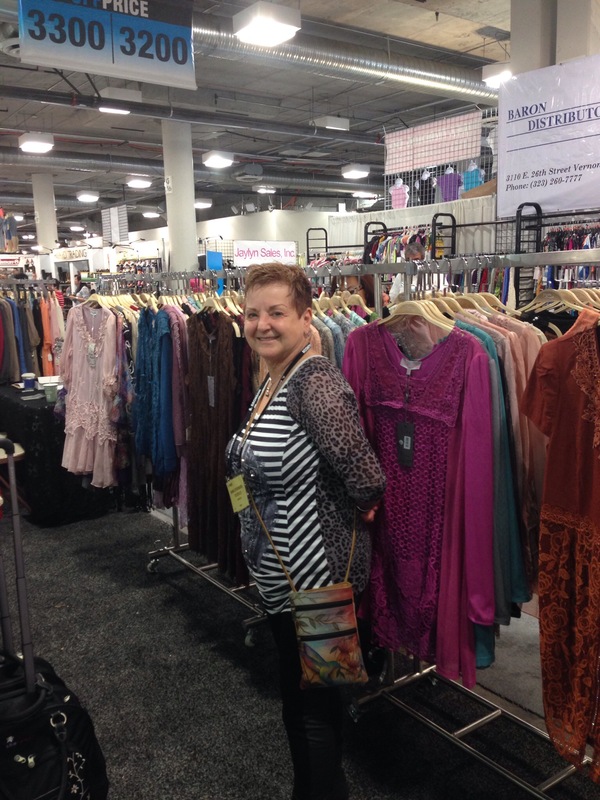 Today we saw Foxcroft, Tribal, Multiples, Alisha D, Belldini, Weavz, Keren Hart, and Lior. It was a very full day, beginning at 9 a.m. and ending at 8:15 p.m. We stopped for an hour lunch but otherwise were working lines the rest of the time. 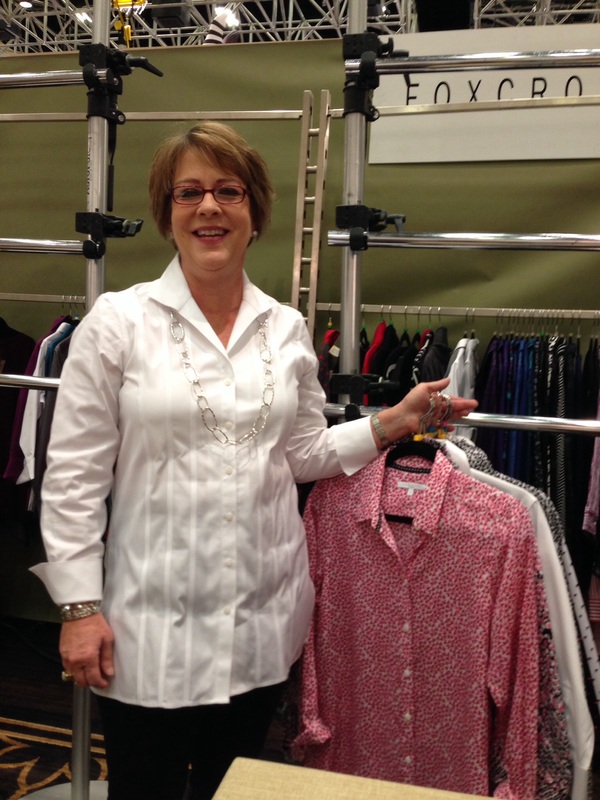 Foxcroft had beautiful tencel blouses as well as their fabulous wrinkle free cotton blouses. I wore my Foxcroft blouse yesterday. It came out of my suit case wrinkle free and was still crisp and beautiful when I hung it back in the closet at the end of the day. Ladies, if you want a great blouse, there is none better in the market! The picture on the left shows an upcoming “blouse tunic” or “big shirt” from Foxcroft. This is the next big tunic style. It looks great with leggins, skinny or straight jeans. You will also be seeing Blouse Tunics this summer so be sure to add at least one style to your summer wardrobe. 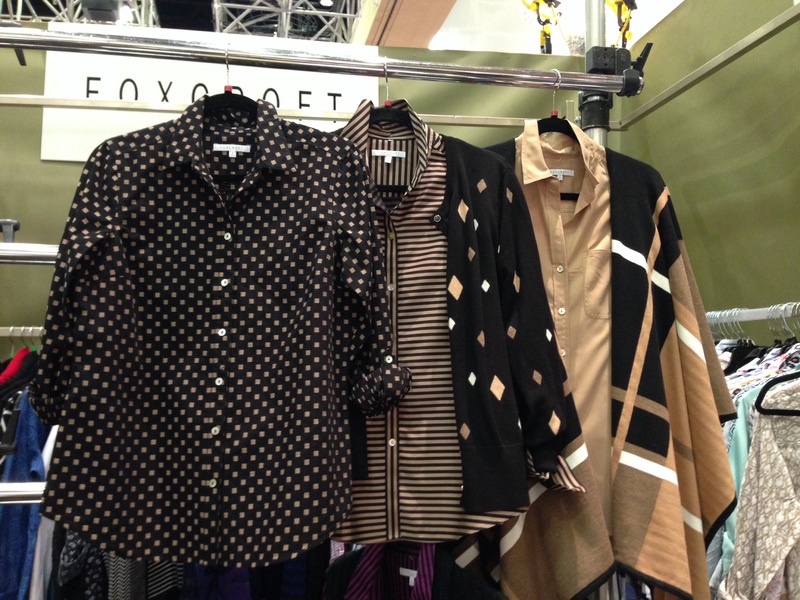 Early fall grouping from Foxcroft with blouses and sweaters. Sales Representative for Fox Croft modelling a blouse tunic that will be in Fashion Crossroads in September. We also saw Tribal today. We were so excited about the fall line. It looks amazing. Tribal hit a home run in balancing casual jean looks with dressy work looks for a very functional line with a ton of fashion and practical pieces. The challenge will be deciding what not to buy! 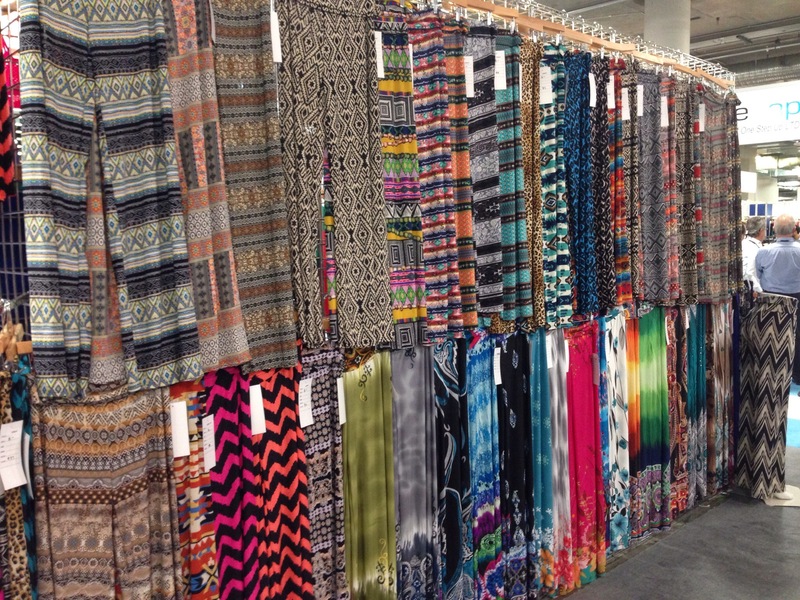 You Tribal lovers will be so happy with what you see from the line both for spring and fall of 2015. It is also worth pointing out that the company expanded their booth and were booked solid all day, with every seat filled with buyers. That’s a good sign both for the line and for the market as a whole. Based upon the number of buyers at both the Off Price Show and the Winn Show, I thnk it is fair to say that buyers are feeling good about the economy which means customers are shopping all across the country. That’s good news for all of us! 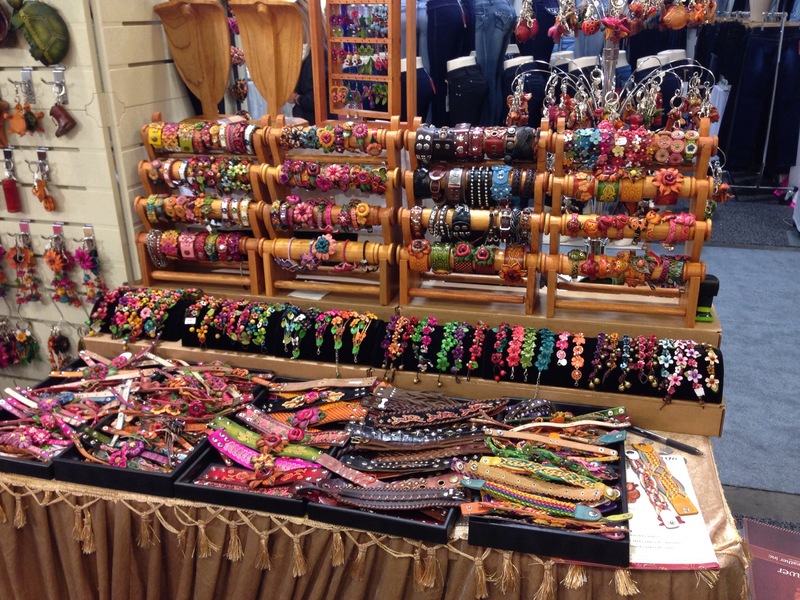 Our first day of our week long market adventure began today at 8 a.m. and the Off Price Show at the Venetian Convention Center. 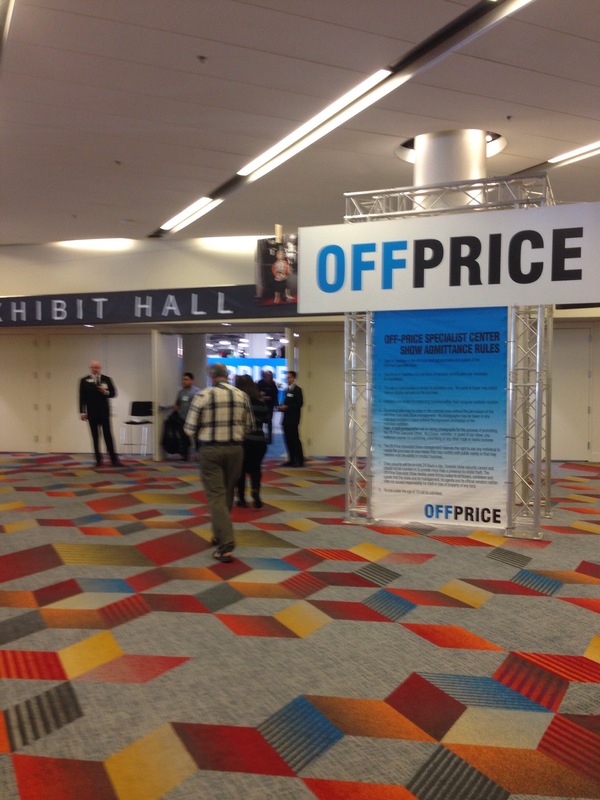 The Off Price show is dedicated to offering over cut, over stock, and close out merchandise at below wholesale. The show is busy, especially on Sunday because many buyers come in one day early to hit this show before the other major shows open on Monday. Buyers arrive and go through registration, get their badge and then pass through security to gain entrance to the show. Once through the doors, the show consists of booth after booth, with no particular organizational method, in a very large convention center. It can be completely overwhelming to a new buyer. Fortunately, after 16 years, we have a handful of vendors we want to see and so we start by visiting each of these and crossing them off our list. Our first stop was Pretty Angel. This booth gets crazy busy as the day progresses and it becomes, well….a bit mobish. 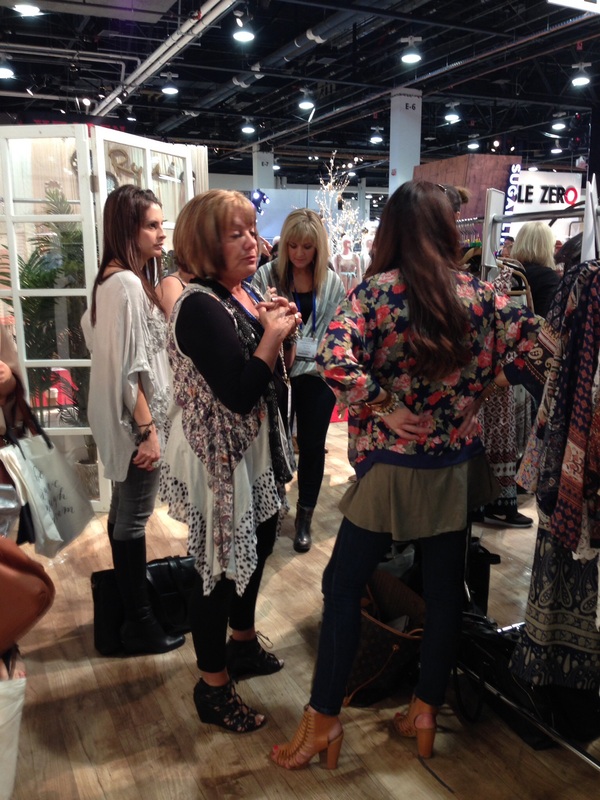 Buyers are all vying for a limited number of samples and sales people and they can get downright ugly. We like to avoid this bro ha ha so we get there early BEFORE the craziness begins. One of the things that becomes obvious quickly is what trends will be key for the season. You can spot them because you see them over and over again at booth after booth. This season it is printed leggings and palazzo pants. 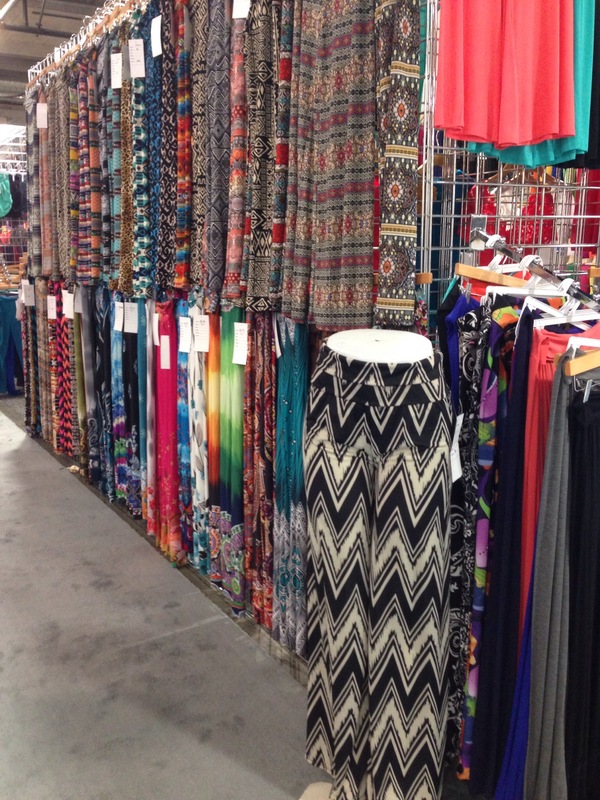 We stopped at Superline and ordered several great styles for FC Outlet and at Sharon Max for Fashion Crossroads. After a busy day of buying, we usually end the day with accessories. Today we saw Sunflower and a couple of great purse lines. It is so exciting to buy things for you and look forward to seeing you get excited about what we chose. 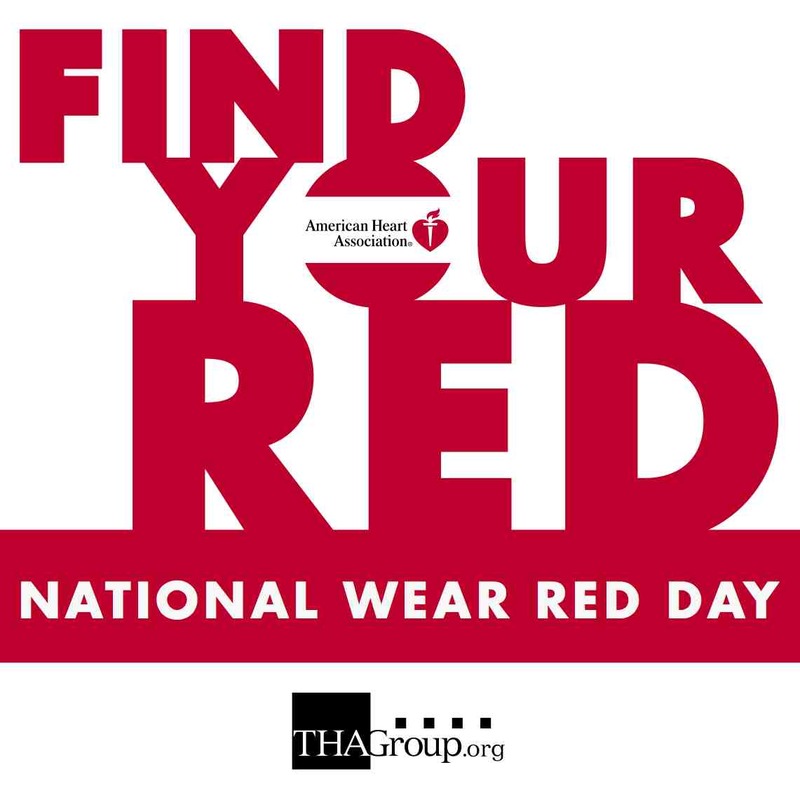 Friday, February 6th is National Wear Red Day to bring awareness to the risk of heart disease in women. Part of our mission at Fashion Crossroads is to empower and educate women to fulfill their inner and outer beauty. So, naturally, this is an event we want to support. We are encouraging all of our staff and customers to WEAR RED THIS FRIDAY, and educate yourself about heart disease. We’d love to give you a Hershey’s Kiss and a great big hug on Friday for coming in to either Fashion Crossroads or FC Outlet wearing red! If you find yourself heavier than you’d like to be this February, there are many great ways to incorporate loosing a few pounds and technology. I wear a Body Media Fitness Band everywhere I go. It tells me how many calories I have burned, how many steps I have taken, how many minutes of moderate or vigorous activity I have had each day, and how many hours of sleep I got the night before. Fit Bit or Jawbone also offer great fitness trackers. These gadgets can help make getting fit fun! I also use My Fitness Pal to track my calories each day. This free app makes calorie counting easy and fun. You can simply scan a product’s bar code with your smartphone and record a food item in seconds. Using these two things together, I have figured out how many calories I typically burn and how many I can consume if I want to maintain weight or loose weight. This has really helped me stabilize my weight. The other gadget that I love is my Withings Scale. It tells me not only how much I weigh but also what my body mass index and resting heart rate are. These are also important measures of fitness. I encourage you to make a healthy lifestyle plan for 2015. Join with a girlfriend and get walking or going to the gym! If you do, let us know! Post on our Facebook page or Twitter page that you are getting heart healthy! We will celebrate with you and encourage you to meet your goals.